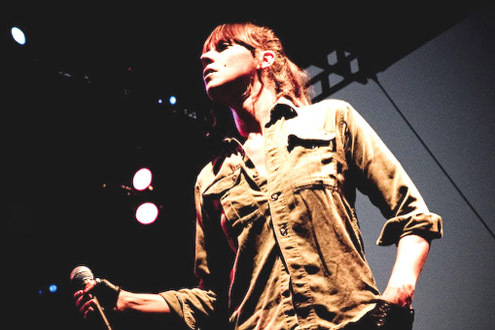 The inimitable Cat Power returns to our shores this January performing at the Sydney Opera House, Perth’s outdoor venue ‘The Quarry’ and for select headline dates. It’s the second successive summer drop-in for Cat Power who is a firm lover of our isle dating all the way back to 1998. That visit saw Cat Power a/k/a Atlanta born songstress Chan Marshall, in solo mode, supporting the Tren Bros – the side project of the Dirty Three’s Mick Turner & Jim White – in venues as intimate as Sydney’s now defunct Hopetoun Hotel, Byron Bay’s tiny Railway Hotel and Melbourne’s also defunct Punters Club. Turner and White (along with STM bassist Andrew Entsch) also backed Chan up on that visit for the recording of her much loved Moon Pix album which featured the ground breaking Crossbones Style. Over the years Cat Power has continued to visit Australia on a semi-permanent basis (usually in our summer) and has appeared in solo mode and trio mode, in pubs, dining rooms and theatres and most recently with the services of ‘Dirty Delta Blues’, a purpose-built five-piece combo featuring Dirty Three drummer Jim White and Jon Spencer Blues Explosion guitarist Judah Bauer. The size of the shows have also built since then and in recent times Cat Power has appeared on the main stage at the Pyramid and Days Like These Festivals as well as headlining sold-out performances at Sydney’s Enmore Theatre, Brisbane’s Powerhouse and Tivoli Theatres, Melbourne’s Forum Theatre and Perth’s Astor Theatre, amongst many others. Cat Power returns this time showcasing material from her new album (currently in progress and largely recorded by Chan herself) as well as old favourites and will again feature the talents of Jim White and Judah Bauer. Tickets for all shows are on sale Friday December 10th (except *) and are expected to sell fast!